Natalie Krentz's book, the reworking of a doctoral dissertation discussed at the University of Erlangen-Nürnberg, aims to compare and to intertwine two lines of research which have shown great vitality in the recent historiography about the Reformation: the first, developed in the Anglo-Saxon world, that studies rituals and ceremonies, and the other about the so-called städtische Reformation, which has nourished a long-lasting debate in German academia. The book's purpose is to show the possible interactions between these two apparently different approaches, by choosing Wittenberg, the centre of the early Reformation, as testing ground for the experiment. From the beginning, the choice of focusing on the bulwark of the Protestant movement appears to be successful. As the author explains, after 1945 Wittenberg was only scarcely considered by Reformation scholars because of its geographical isolation as part of the GDR. Quite astonishingly, the founding place of the Reformation was left at the margins of historical interest, thus opening space to Krentz's research in the Wittenberg archives. Her effective investigation offers a precise reconstruction of the internal dynamics among different components of the civic life (prince, Rat, etc. ), enabling fundamental moments of the Reformation history to be placed in context. 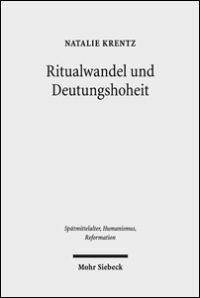 Thanks to a close analysis of the social agency operating within the city, the author throws light on important episodes of the Reformation (the Wittenberger Unruhen and the Invokavitpredigt) and is able to show the invention of a religious tradition in its own making. The volume is chronologically organized in four different sections. First of all, attention is given to the institutional and political situation of the city before the Reformation (1500-1520), when Wittenberg experienced a profound change. At the beginning of the century, Wittenberg was chosen as Residenzstadt by the Elector Prince Frederick the Wise, who wanted to transform the city into the sanctuary of the dynasty and of the whole territory. Within a few years the Wittenberger Schloss was built, a new university was founded and a new collegiate church, the Allerheiligenstift, was created as a part of the residential palace itself, with its treasure of relics and indulgences. These measures had immediate consequences on the internal configuration of the city: the "normative centralization" (here the author rightly deploys Berndt Hamm's conceptualization), promoted by the prince, deprived the city magistrates, in particular the parish church and the city council, of their traditional powers. The phenomenon effected even the religious sphere: as it was happening in many other European cities of the time, state building processes were involving more and more of the spiritual field. In the case of Saxony, the conflict was shaped by the confrontation with the bishop of Brandenburg, to whom Wittenberg was subject; the gradual separation of the city from the bishop's tutelage contributed to its inclusion into the regional territorial state. This premise is essential in order to understand the second part of the work, which focuses on the events occurring in the city in 1521-22: the famous Wittenberger Unruhen. 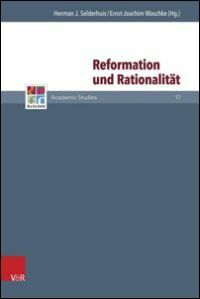 The precise contextualization offered by Krentz minimizes the influence exerted by the "radical Reformation", e.g., by Karlstadt and by the Zwickau Prophets, and helps to explain the incidents of those years according to discussions specific to the city. First of all, the protestations and turmoils were not univocally interpreted; on the contrary, the perspectives of the Wittenberger actors could be very distant. To quote only one example, while Karlstadt saw the decision of distributing the communion "in both kinds" as an act of desacralization, many prominent members of the city considered it as a further symbol of the holiness reached by the Wittenberg community, the role model for the "reformed" Christianity. Essentially, the Unruhen give evidence that the city was slowly adapting to the sudden changes of the preceding years. Inspired by the new Christian message of the Reformation, the city council managed to tip the balance of power in its favor and to create a new equilibrium with the prince. When Luther came back from his Wartburg exile in 1522, he hastened to intervene in the debate. The Invokavitpredigten, which Luther delivered right after his return to Wittenberg, are traditionally regarded as his official riposte to the iconoclastic movement which was igniting the Southern regions of the Empire. Here, such an explanation is rejected and attributed to Luther's later reinterpretations, after he had started his harsh quarrels with Karlstadt. When Luther gave these sermons, his target was however much more immediate and geographically closer: he was trying to take control over the reforms implemented by the Rat and the prince. The third part of Krentz's book deals with the attempts made by Luther in order to assert his charismatic power and to gain recognition by the city authorities. The liturgical and ritual reforms could be implemented only after Luther's return to Wittenberg, between 1523 and 1525, when the Reformer succeeded in finding a compromise between the prince, the city and his own theological beliefs. The restructuring and the substitution of old Catholic ceremonies permanently modified the institutional organization of the city. The church of the prince's palace, the devotional heart of the city in Frederick's original project, lost its prestige and was subsequently dismantled. During the negotiations, Luther revealed his ability as a political leader and as a valuable mediator. In fact, he managed to change the policy of the prince, while preserving his primary idea of making Wittenberg the devotional capital of the region and the territory. Consequently, while the Allerheiligenstift was closed soon and its relics were sold and given away, the importance of Wittenberg as the religious capital of the Land was reaffirmed in a new guise. This time it was not the royal reliquary to be the centre of the pilgrimages, but the parish church and Luther's pulpit. In Wittenberg, 1525 was a watershed year, as it was for all of Germany. The particular relevance of this year does not reside, however, in the outbreak of the Bauernkrieg, but above all in the dynastic succession on the throne of Saxony between Frederick the Wise and his brother John the Constant, who was much more prone to religious innovations. The fourth and last part of the volume, the less elaborated of the book, is devoted to the enforcement of Luther's reform in the city and in the whole region under the aegis of the new prince. These final pages show how Wittenberg took the shape of "the" city of the Reformation thanks to the collaboration between city magistrates and the prince. Inverting a famous oxymoron of the Italian microhistory, one might say that Krentz's book depicts the normality of an exceptional case, such as Wittenberg. Undertaking a detailed survey of the relations of power between the different agents of city life, the author offers a thorough overview of the "Wittenberg constellation" and of its functional mechanisms, which can be compared in many respects to those of other early modern cities (state building processes; conflicts of powers; permeation of the spiritual sphere into the secular one). However, the Wittenberg case distinguishes itself from this traditional framework because of the exceptional events brought about by the Reformation, events soon elevated to the status of legendary acts. The attention given to historical memory is a second strong point of Krentz's research. The book discloses in fact a great ability in deciphering much-celebrated events of the early Reformation and in bringing them back to their original meaning within the institutional and religious context of early modern times.